Sweet potato pone is a southern favorite that can be served any time of the day. Enjoy April McGreger’s delicious recipe for a historical dish while celebrating National Sweet Potato Month this February and all year long! Recipe from Sweet Potatoes: a Savor the South® cookbook by April McGreger. Copyright © 2014 by April McGreger. Hundreds of versions of this grated sweet potato pudding or pone can be found in historical and community cookbooks. Creole variations often contain a generous shot of black pepper, which I have come to love. Well- heeled versions might call for orange blossom or rose water. With equal depth and breadth, sweet potato pone is the sixth man of traditional southern cuisine. It is often served as a side dish to pork or game but is also right at home with afternoon coffee or as a simple dessert. According to the late champion of southern foodways and culture Eugene Walter, some even consider it an ideal breakfast with ice-cold buttermilk and hot black coffee spiked with cognac. The elemental flavors of old- fashioned pones appeal to young eaters as well, so much so in the case of my two year-old son that he has earned the nickname Tater Pone. Melt the butter in a large cast- iron skillet. Pour the butter into a large bowl and whisk in all ingredients except the sweet potatoes until well combined. Fold in the grated sweet potatoes and pour the mixture back into the skillet. Bake for about 1 hour, until well browned around the edges and on top. Let cool 15 minutes before serving. April McGreger is founder-chef of Farmer’s Daughter, a farm-driven artisan food business in Hillsborough, North Carolina. 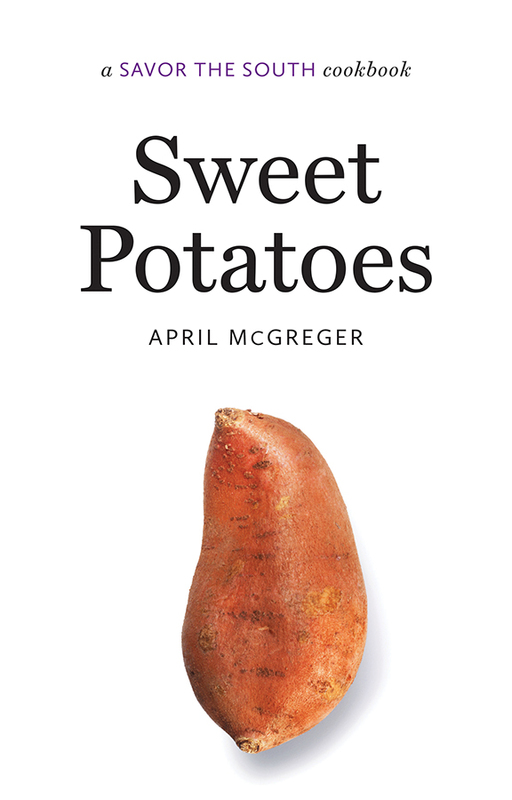 Her book, Sweet Potatoes: a Savor the South® cookbook, is now available. Connect with McGreger on Twitter @farmersdaughtr, and don’t forget to “like” the Savor the South® book page on Facebook for more news and recipes.